You must be a member of the Luxembourg Culture Group to attend this activity. Would you like to join this group? ...because they are dramatic, thrilling, epic and ... just wonderful and exciting? 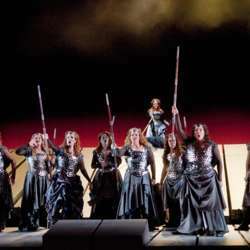 Then do not miss out this one: Die Walküre is the second opera in Wagner’s monumental Ring cycle and has long stood on its own as an evening of extraordinarily powerful theater. Part of this appeal lies in its focus on some of the Ring’s most interesting characters at decisive moments of their lives: Wotan, the leader of the gods; his wife, Fricka; his twin offspring, Siegmund and Sieglinde; and, above all, Wotan’s warrior daughter Brünnhilde. These characters and others follow their destinies to some of Wagner’s most remarkable music. The entry fee of 33€ includes an apéro before the start, drink and hors-d'oeuvres but there are 2 breaks of around 20 minutes and the whole evening lasts long, so ... come prepared ! We have seats 13/14 in rangée J/I .